Anyone who has ever played or watched hockey knows just how bulky a goalie is when wearing his gear. 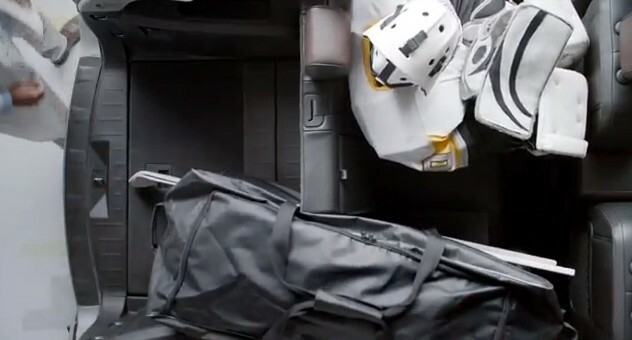 And while all crossovers have room for stuff, the Chevy Equinox has the most rear seat legroom of any 5-passenger vehicle in its class, plus an amazing amount of cargo room thanks to the Mutli-Flex sliding rear seat — enough to fit a hockey goalie and all of his stuff. Just like the commercial highlighting the Equinox’s height programmable power rear liftgate, this spot ends with Chevy’s new tagline: That’s American ingenuity, to Find New Roads. Just like the tailgate ad: well-played Chevy. Well-played, indeed. This points out the real issue most owners on the Nox and Terrain forum complain about. If you carry golf clubs or in this case hockey sticks you have to fold the seat down. Many would like to lose a little of the rear seat room as they would want a little more cargo. The rear seat room is enough that if they lost just a little no one would complain and the cargo room would be notices. I expect the next model to be packaged a little better than this one. This one is good but it has a lot of wasted space in the dash area and the rear seat has more than it really needs. How often to you haul a Goalie? Cargo room is one with the seats up is often the most requested fix. That and better vents for AC in the rear. My HHR has nearly as much room. It is obvious that you don’t own an Equinox. I have a 2009 model and it has plenty of cargo space, even with the rear seat all the way back. And you dare to compare the Equinox with a puny HHR? That phrase “nearly” is just as bad as saying Danny DeVito is “nearly” as big as Arnold Schwarzenegger when they acted together in “Twins”! ??? Not sure if you noticed but the rear seat moves back and forth about 6″. So if you need the cargo area and have small kids you move it forward. We did this all the time. 12 and 14 year old had just enough legroom when full forward on our long trips with luggage. We did end up with an Enclave since we needed more cargo space but this is more a class size issue. We need a larger vehicle and GM has them. Who performs the music for the 2013 Equinox “Room for a goalie” commercial ?